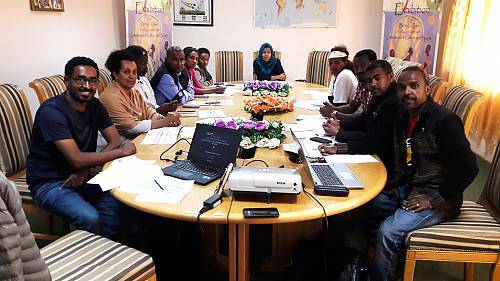 At its first meeting, the National Committee of Eritrea adopted an Action Plan for 2018 to 2020, which outlines the main actions to be undertaken for safeguarding Eritrea’s intangible cultural heritage, namely the implementation of safeguarding measures, elaboration of inventories and international cooperation. The Committee will work in four task teams, responsible for research, documentation and archives, communication and general management. With the founding members from the Ministry of Education, the Research and Documentation Centre, the National Union of Eritrean Women, the National Museum, and academia, it aims to work with a wide range of national stakeholders ranging from various ministries to community leaders. The creation of the Committee was the final activity of the UNESCO project: ‘Strengthening the capacities of Eritrea for implementing the Convention for the Safeguarding of the Intangible Cultural Heritage’, funded by an earmarked contribution of the Kingdom of Norway to the UNESCO Intangible Cultural Heritage Fund. The project supported the safeguarding efforts of Eritrea through awareness-raising and capacity-building activities, which led to the adoption of the country’s first heritage legislation and the development of a national inventory. A joint evaluation of the project will be carried out by UNESCO and the Eritrean Intangible Cultural Heritage Section of the Eritrean Commission of Culture and Sports from 22 to 26 October 2018. For more information on Intangible Cultural Heritage in Eritrea, please consult here.